In the modern High-rise building construction, the construction elevator is the most important equipment which is used in big-scale tower crane. Generally, the construction elevator can be divided into three kinds in speed, low-speed elevator in the speed range of 0~40m/min, medium-speed elevator in the speed range of 0~63m/min, high-speed elevator in the speed range of 0~96m/min. (5) Running speed is always low, in the range of 34~38m/min. This low-end system will reduce the construction speed and also reduce the benefit of enterprises. If we only increase the operation speed, the concussion of structure and mechanism will be enlarged and increase the abrasion between gear rack and brake disc accordingly, it will reduce the reliability of operation. As the layers increase, for the building which the height is more than 400m, the high speed elevator of 96m/min will be used to increase the construction efficiency, It need very big braking resistance to consume the regenerated energy while the elevator going down. It has big security risk and energy losing in the application of long-term braking (length of 400m, braking period more than 5min). The whole system consists of PLC, frequency inverter, energy feedback system, electric motor, reduction box, AC input reactor, transformer, operation hand shank etc., to control the start, stop, up going, down going, brake and every kinds of protection of the elevator. The elevator will work at the condition of high-efficiency, safe and stable, meanwhile, the regenerated energy while the elevator going down will be fed back to the power grid to save energy. (5) The system has perfect safety protect functions such as under voltage, over voltage, over torque, over current and so on; it enhances the reliability and safety for the total system. (6) The system adopts low-speed braking method, the small rotary friction force prolongs the working life of brake effectively. 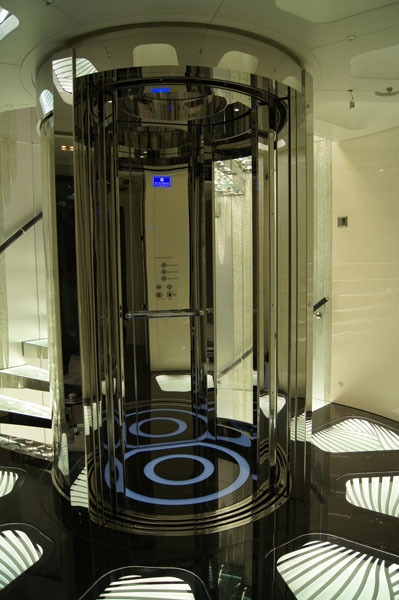 (7) Compare with traditional non speed adjustable elevator, the comfortable feeling during operation is wonderful.